By Daniel Horowitz--Toronto City Council has taken the strong step of condemning the term "Israeli Apartheid," by a vote of 26-7. 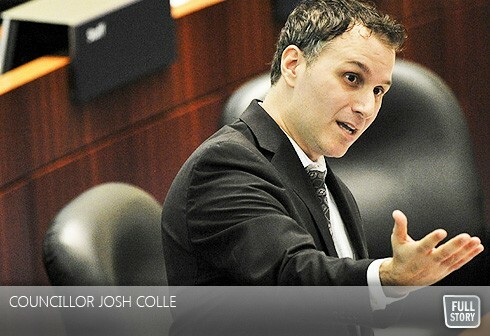 In passing the motion on June 7, introduced by Councillor Josh Colle, Toronto joined the Ontario Legislature in its condemnation of the words often used by Israel's opponents to castigate the Jewish state. At the same time, council reaffirmed its $123,000 grant to Pride Toronto, the organization that runs the increasingly popular and well attended Gay Pride festival and parade that attracted several hundred thousand people last year. Council had been under pressure from some Jewish community activists to withdraw its funding from Pride if a group calling itself Queers Against Israeli Apartheid (QuAIA) fulfilled its intention to march in the parade. The condemnation, coupled with an affirmation of Pride funding was an attractive compromise for most city councillors. "We thank City Council for recognizing that the words "Israeli Apartheid" are worthy of public condemnation," said Howard English, senior vice-president of the Centre for Israel and Jewish Affairs, UJA Federation of Greater Toronto's advocacy arm. "The term is hurtful, hateful, divisive, damaging to the parade and a distortion of history." English said that QuAIA would now be marching "under a cloud of condemnation," out of step with the sentiments of the vast majority of Torontonians. The next episode in the Pride parade drama will take place later this month, when the city's executive committee considers a new policy to deal with the participation of groups like QuAIA in municipally funded events.